Opened in 1827, Sri Mariamman Temple is dedicated to Goddess Mariamman. She is known for her power in curing epidemic illnesses and diseases. This temple is located in Chinatown and has an ornamental tower entrance which is like a landmark to worshippers and Singaporeans. It was inspired by Mr Naraina Pillai who is known to have accompanied Sir Stamford Raffles (Founder of Singapore) on his second visit to the island in 1819. 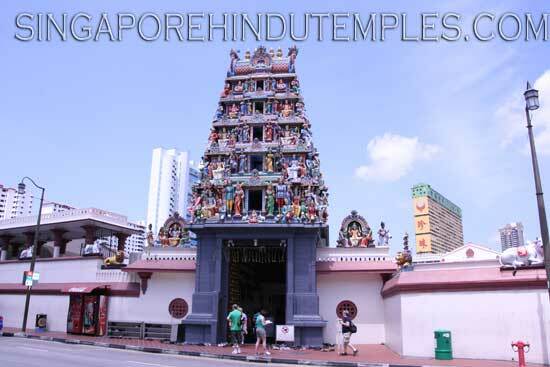 Originally,this temple was to be built along Telok Ayer Street but due to a lack of a convenient source of fresh water the temple was allowed to be built near today's Stamford Canal in 1821.But due to colonial town planning, the South Bridge site, where the temple currently stands was finally granted to Mr Pillai in 1823. By 1827 a temple structure made of wood and attap was built at South Bridge Road. "Sinna Amman" a small deity of Mother Goddess was installed by Mr Naraina Pillai in 1827 when the temple was first built. It is an interesting fact that this deity still has its divinity in the main sanctum of the present day temple. This temple has existed for more than a 180 years in which it underwent close to five redevelopment and redecoration phases. such as plaster and bricks walls done in 1843, in 1962 new temple structure was developed with intricate sculpture works. In late 1800 main Gopuram(grand tower entrance)was built, It was rebuilt in the 1930s and repaired and restored with elaborate proliferation of sculptures in the 1960s. Other Improvements include the addition of a new viewing gallery and the construction of a three storey complex complete with elaborate facade, spacious interior and technologically superior facilities. Housed in the complex is a state of the art auditorium ideal for weddings, multimedia presentations, corporate meetings, seminars, and cultural events. Sri Mariamman temple served as a refuge for new immigrants during colonial times until they found work or a place of their own to stay. The temple served as an important focal point for community activities and acted as the Registry of Marriages for Hindus at the time when only the temple's priest was authorized to solemnize Hindu marriages.